Dundreggan dam collects water from the River Moriston. Underneath the dam are the turbines of Glenmoriston power station. This was the first underground hydro-electric station built in the UK. Water from here discharges via a tunnel into Loch Ness. The Great Glen scheme lies along the shores of Loch Ness and the area to the west of Fort Augustus. It takes advantage of the heavy rainfall in this region, which averages four times greater than on Scotland’s east coast. This is one of the wettest regions in the entire UK. 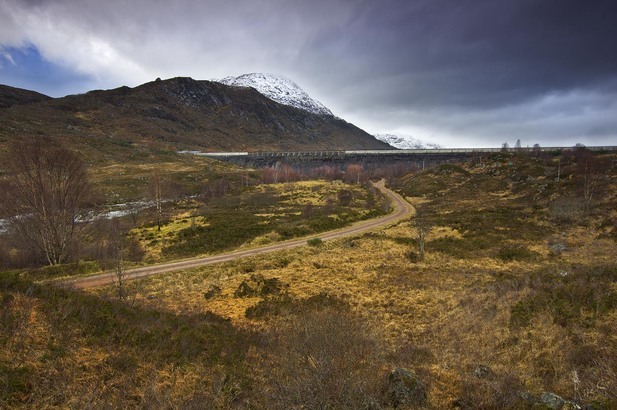 Completed in 1957, the Great Glen scheme contains two main sections with five power stations. The southern section centres on the catchment for the River Garry and the northern on the River Moriston. This scheme pioneered the use of underground stations in the UK. This design found favour in the Highlands as they protected the area’s scenic beauty. At the top of a cascade system, Loch Cluanie dam provides the main storage for the scheme’s northern section. It collects water from nearby catchments and via a tunnel from Loch Loyne. For the first time in Britain, slag or waste from blast furnaces replaced 70% of the cement usually required for building dams.